We all know how agonizing last week’s loss to Stanford was, but a lot of good came out of a tough night Saturday at Autzen Stadium. Oregon’s easy non-conference slate offered a chance for the Ducks to fine-tune things and answer some key questions. Unfortunately, on the offensive side of ball, the nonconference slate not only left some questions unanswered, but raised even more. Against Stanford, the Oregon offense, inconsistent against lesser competition, appeared fine-tuned and physical. Justin Herbert was electric in completing 26 of 33 passes for 346 yards and touchdown. He made the types of throws NFL scouts drool over while showing off his early first-round NFL draft potential. 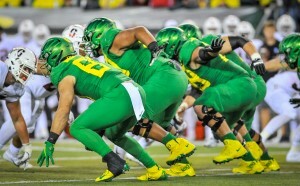 The Ducks battle in the trenches. The running game, underachieving in its first three games, came to life as CJ Verdell established himself as the lead back, running for 115 yards and a touchdown on 20 carries. Verdell showed off the mixture of speed and physicality that pegs him as a future (or maybe present) big-time player. 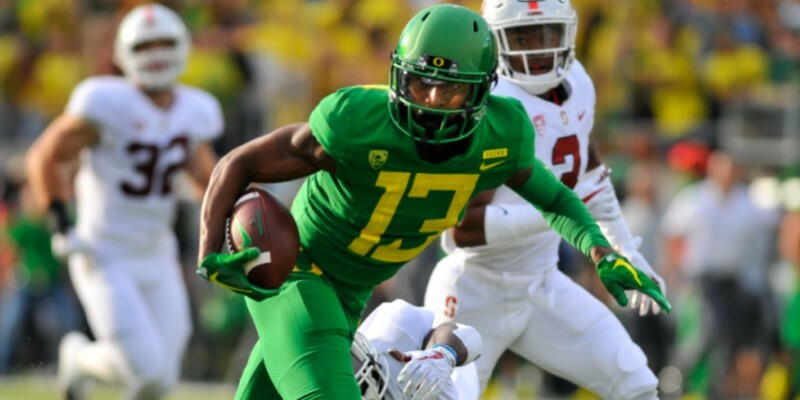 One significant question coming into the season was whether a “go-to” wide receiver would emerge Ducks. Question answered. Herbert connected with receiver Dillon Mitchell 14 times for 239 yards on Saturday night. Mitchell approached with the single-game school records for receptions (16, by Samie Parker vs. Minnesota in 2003) and receiving yards (242, by Tony Hartley vs. Washington in 1998). Oregon’s offensive line controlled the Cardinal throughout the game while showing off its new-found physicality. Of course, this translated into the Ducks being a victim of their own success when Coach Cristobal elected to run the ball in the final minute of the game instead of taking a knee to kill the clock. Cristobal felt confident in getting one final first-down to ice the game. The Oregon defense proved to be stout against the run by holding arguably the nation’s best running back, Bryce Love, to nineteen carries for 89 yards and one touchdown. At half-time the Ducks had a shocking 304 yards of total offense, with the Cardinal at only 136. Dillon Mitchell reaches for six. The flip-side of this was that the Ducks allowed Stanford quarterback KJ Costello to pass for 327 yards and three touchdowns, giving up several long passing plays. The big and physical Cardinal receivers had their way with the Oregon secondary. Of note, for the third week in a row, Oregon’s opponent had a tight end lead the team in receptions, as Stanford’s 6-foot-5 Kaden Smith had six catches for 95 yards. It’s apparent that big pass catchers are a thorn in the Duck’s side. Many feared after the lackluster non-conference schedule that Stanford would come in and dominate on the road. Instead, the Ducks played better than most could have imagined. The Ducks were the better team on Saturday … for about 55 minutes. Unfortunately, for the few minutes that the Cardinal controlled the Ducks, they completely lit up the scoreboard. Coach Cristobal “won” the off-season. Now, how the Ducks rebound this week against Cal will go a long-way in determining whether he will win the season itself. A former Oregon coach once stumbled in his first big-game (Boise St, 2009), righted the ship, and ended up in the Rose Bowl. Here’s hoping something like that happens again. 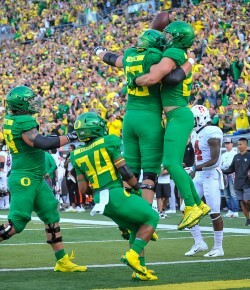 The Ducks celebrate in the end-zone. This week, the Ducks take the show on the road for the first time this season at Cal. And this is a Golden Bear team playing solid football with ex-Duck Justin Wilcox at the helm and pointing things in the right direction. The 24th-ranked Bears are a team that plays solid defense, as they rank 16th nationally in total yards allowed (302.3 ypg), and 27th in passing yards allowed (170.7 ypg). They have not allowed a first-half touchdown so far this year, and are 3-0 versus North Carolina, BYU, and Idaho State. Redshirt freshman quarterback Chase Garbers is an accurate passer who throws with nice touch and placement to give his receivers an opportunity to make plays. The Ducks better bring an improved pass defense to Berkeley. The early September cream-puffs are now a distant memory for the Ducks as the Pac-12 — though possibly lacking a proven elite team thus far — is a deep conference. This is especially true in the Pac-12 North, where no less than five teams are extremely dangerous, and our neighbors in Corvallis aren’t quite the doormat they were last year. Hopefully the Ducks leave the Stanford loss in the rear-view and don’t allow the Cardinal beat them twice as conference play kicks into high-gear.